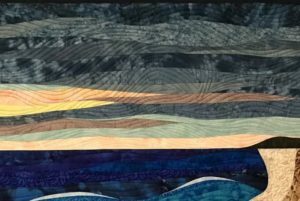 Art quilting is a retirement artistic journey for me and is ALWAYS enjoyable, something I look forward to doing each day. 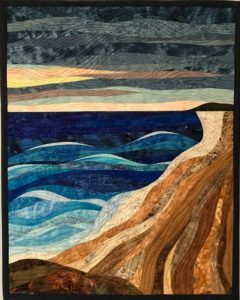 BUT….sometimes the stars align themselves and creating a quilt energizes me as has happened with “Coastal Storm” which I finished yesterday. I saw some paintings with this orientation and I decided to step out of my typical dozen or so beach/ocean/dunes designs and try something different. I also thought creating a more vibrant and active ocean and a stormy sky would be fun. AND IT WAS!! This sky is more grey with less daytime colors. The water is more curvy with more contrasting colors and more white slivers depicting cresting waves. And the sand/beach area is different and lets you imagine….is it a cliff? Is it just sand? I used much more motion in the quilt stitching too. Often beach quilts are quilted with a gentle varied curvy running stitch that adds to the calm serenity of a nice day at the ocean. 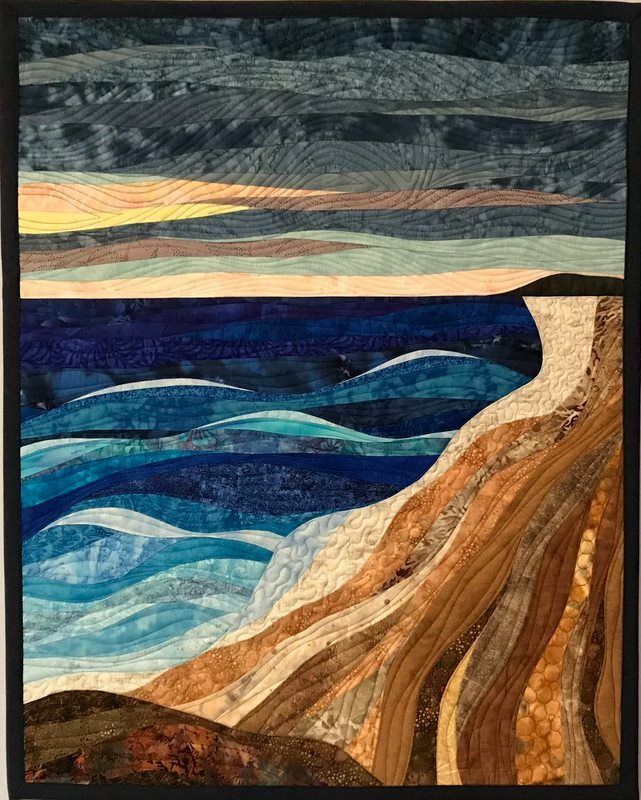 With this art quilt I used more dramatic curves, some stipling to designate the sand closest to the water, and some fun circles to give the dunes more depth and character. The colors are more vibrant, the stitching is more active and full of motion, and the piecing is full of more curves. All together is conveys a different ocean and beach than my previous serene art quilts.